Let us find the right people for you. Bespoke HR is exceptionally well placed to assist all businesses with their recruitment needs; this side of the business is consistently growing. Through our contacts with numerous businesses and associates, as well as our access to various databases, we are able to source the ideal candidate for your needs. Why get Bespoke HR to help? One of the reasons for our success in this area is that Bespoke HR work closely with our clients. We understand your business needs and those of your existing team. Through combination of skillful interview techniques and close company collaboration the right candidates are found. One of our clients was looking to expand – the right people were needed to help drive the business forwards in the right direction. 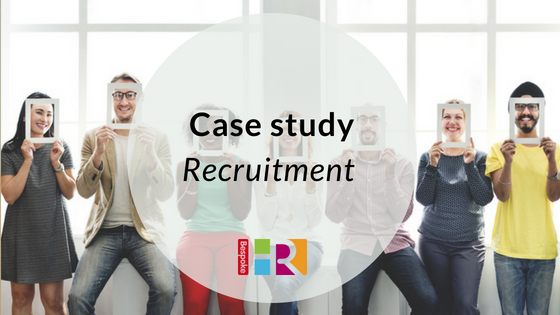 Bespoke HR handled the recruitment process from start to finish. Having identified the candidate requirements we selected the best medium for advertising, placed the advert, collected applicant CVs and conducted first stage interviews at our offices. Having identified the best applicants, we then worked with our clients to conduct second-round interviews. The best candidate was selected for the position and the Company only needed to be involved in the crucial last step. All the time-consuming paperwork was handled by Bespoke HR. A typical charge for recruitment is approximately £1,500 – £1,800 but will depend on the position and nature of the business. This is a substantial saving compared to recruitment agents who typically charge 12 to 15% of the annual salary.